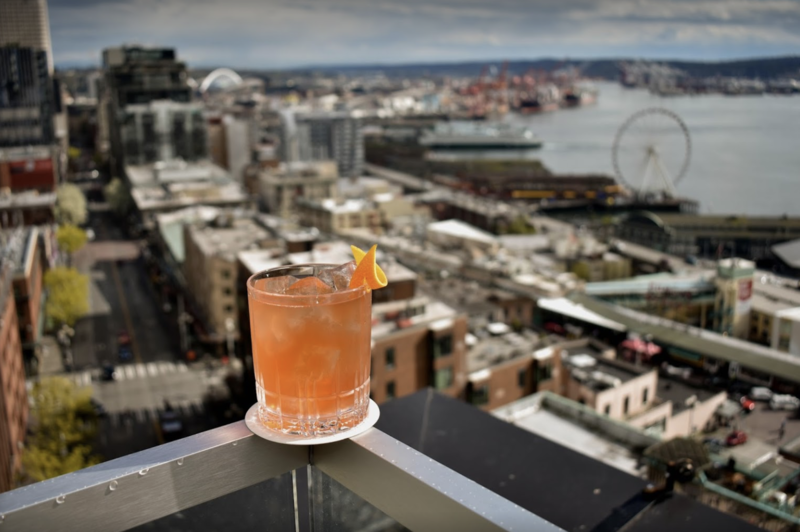 Here is your go-list of the top rooftop bars in Seattle, if we missed any send us a tip at c@eatseattle.co. We added a Google Map link so you can get directions easily. Pop it open from your phone and try. Bookmark this page and share it with your friends. Overlooking a land and sea scape beyond words, take it from the top at Thompson Seattle’s rooftop bar, lounge and terrace, which houses a unique bar experience that is like no other in the Pacific Northwest complemented by a small menu of snacks from Huxley Wallace Collective and the service vision seen in Scout. Artful rooftop space with a modern Middle Eastern–meets-Mediterranean menu, drinks & sweeping views. Stunning views of the Space Needle and South Lake Union. Hip New American hangout featuring modern cocktails & a sleek patio with skyline views at a hotel. Beautiful outdoor fireplace with plenty of seating, outdoor games like Ping Pong and Floor Shuffleboard. Located in Capitol Hill, this rooftop patio is perfect for cocktails in the summer as you quench yourself with margaritas with mezcal and Oaxacan plates. The rooftop seats 95 people and has a full bar. Central to Pike Place Market, this outdoor patio has views of the Public Market and Elliott Bay. The space offers beautiful cabanas, a fire pit and a bar. This rooftop-patio filled with picnic tables and hanging lights features 10 taps pouring a rotating selection of at least 13 brews, including a pair of IPAs (Stargazer and Coffee), pales, and porters. Light views of Salmon Bay and the Fremont Cut.